Follow the callouts below to learn about the parts of the Survey Viewer. 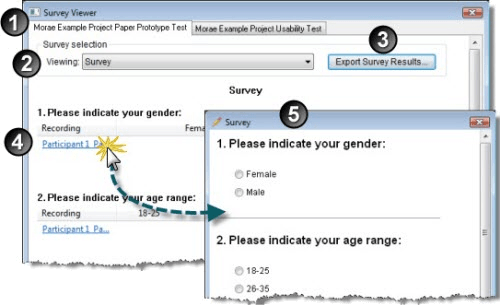 Select a survey from the dropdown list of all surveys in the selected study. Click to export all results for the selected survey as a CSV file. View the results by question for all recordings in the study. Click a recording name to open a survey to edit or enter survey answers for the selected recording.